Like Rolling Stones farewell tours or the McRib, every few years they seem to come back. I’m talking about those ready-made-for-reposting, viral-friendly photographs of McDonald’s food that doesn’t seem to ever rot. Earlier this week, Buzzfeed posted a video that showed burgers from seven different fast food restaurants that had been stored in glass jars for 30 days. At the end, some of them were covered in mold, but some (McDonald burgers in particular) did not look much different from Day 1. This isn’t a new visual aid. Karen Hanrahan famously purchased a McDonald’s hamburger in 1996 that she still carries around as a prop to discourage consumption of fast food in favor of unprocessed food. Countless others have done the same. Of course, the result is fairly disturbing visually. What the heck is wrong with McDonald’s if their burgers are unable to go bad? The video’s YouTube description does not offer any explanation and simply reads: “The less gross they look, the more disturbing the results.” Is there something inherently awful with food served by McDonald’s and Jack In The Box, as the video would imply? Is this some awful Frankenfood we should be wary of at all costs? J. Kenji López-Alt, a restaurant-trained chef and managing director of the blog Serious Eats, performed an experiment that explored why fast food burgers seem immortal. 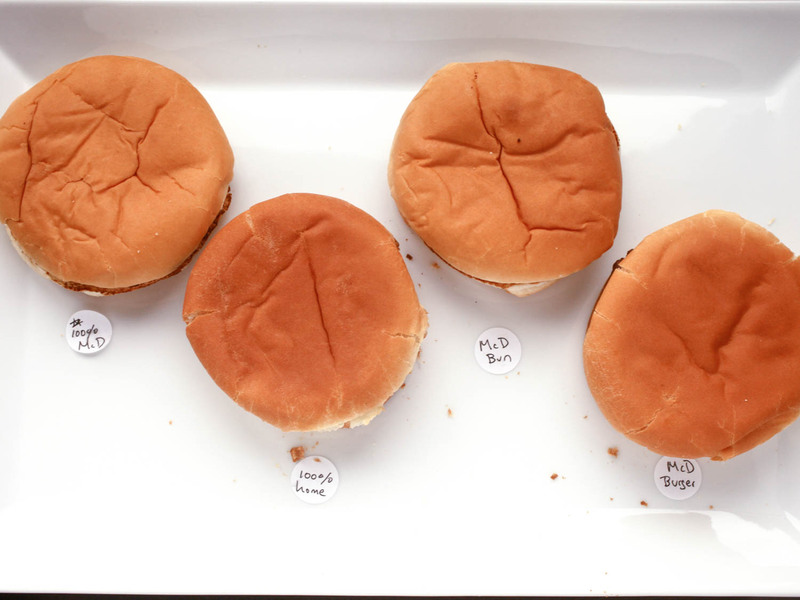 He came up with five different hypotheses based on what he knows inhibits mold growth: presence of some special preservative in the meat or bun, high salt content in the burger, low moisture content, no mold spores ever coming into contact with the burger, or no air where the burger was prepared. The burger was obviously cooked where there is air and mold spores are fairly omnipresent no matter where you go, but they would have been killed when the burger was cooked. Thus, the latter two hypotheses were quickly thrown out. The ingredient list for a McDonald’s bun isn’t much different from those bought at the store and the patties claim to be 100% beef, so there were no obvious preservatives that would inhibit mold. Still, he decided to test the burgers from McDonald’s against some that he made in his kitchen. Nine different burger combinations were made by mixing and matching the buns and patties from McDonald’s and from his kitchen. Some of his patties had added salt, while others did not, and he also varied the types of packaging. His hands never made direct contact with any of the burgers, which were all left in the open air. More than three weeks later, the McDonald’s food hadn’t rotted, but neither had the homemade patties. The homemade patty with no added salt looked no different than the those with extra salt, indicating it wasn’t the causal factor. The key appeared to be moisture levels. The burgers had each lost a quarter of their weight within the first week, indicating that they had dried out. Without moisture, the mold can’t grow. Since McDonald’s uses thin patties with a lot of surface area, they quickly dry out before they can start to rot. This is the entire principle behind beef jerky. 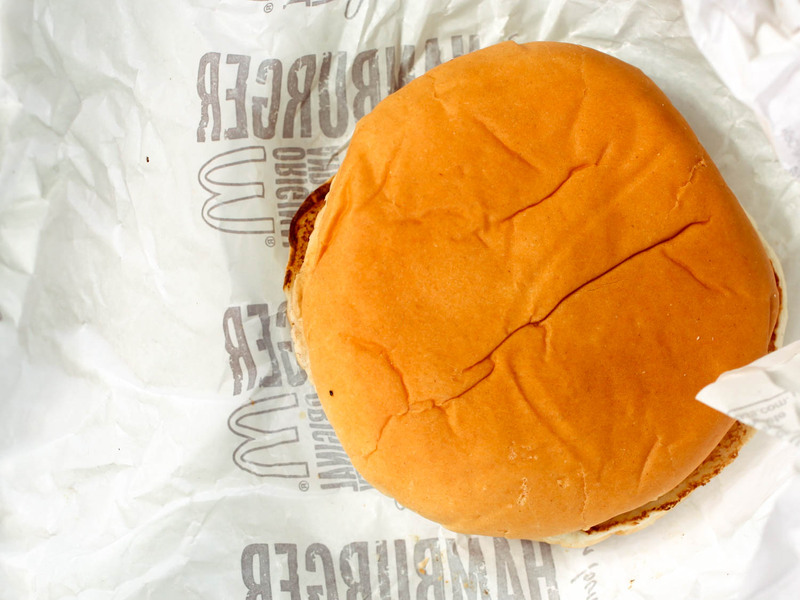 A McDonald’s burger sealed in a plastic bag will be completely consumed with mold within a week. As far as the Buzzfeed video goes, it’s possible that different burger joints use different patty thicknesses, or contain varied ingredients that add moisture, such as different types of cheese or condiments. Also, there’s no way to know if the burgers were sealed within the jars at the same time after purchase, or if some had been given more time to dry out than others. There wasn’t enough due diligence in this video to hail Burger King as haute cuisine and condemn McDonald’s as mysterious Frankenfood quite yet. This doesn’t necessarily mean it’s appropriate to eat fast food several times a week, either. Many drinks from McDonald’s far exceed the WHO’s new recommendation of 25 grams of sugar per day. Heck, a large chocolate shake has 120 grams all on its own. Additionally, most of their sandwiches and wraps make up over half of the recommended daily sodium levels, while medium fries are a quarter of the fat one should consume for the day. If you want to hate fast food because you find the nutritional content objectionable, go right ahead. But criticize what it is, don’t speculate and fear monger about what it is not. This article was originally published by IFLScience. Read the original article.